Sebastian Vettel is beginning to take on the mantle of his German compatriot Michael Schumacher in Formula One. 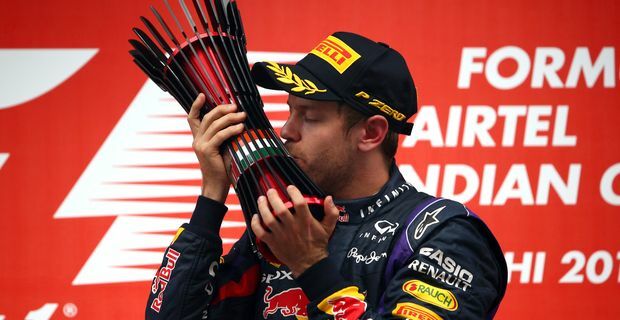 Vettel secured his fourth successive world title by winning in India, doing it in style after fighting his way from the back of the field after a pit-stop. Vettel joined Schumacher and Juan Fangio as the only drivers to win four successive championships. At 26, Vettel is the youngest by some margin to complete the feat. His win in India was as impressive as anything he has achieved all season. He chose to change his soft tyres as early as the end of the second lap, then steered through the traffic to reclaim the lead. He was helped by Red Bull teammate Mark Webber’s misfortune in colliding with Kimi Raikkonen and Fernando Alonso in the early stages. "I’m speechless," Vettel said from the podium, not entirely accurately. "I crossed the line and I was empty. It was one of those moments you want to say something and you can’t. It's a pleasure to jump in the car and give it all for the guys. The car was phenomenal all season." The German’s success has not been universally popular. Red Bull’s and Vettel’s dominance have led some to suggest that the sport has lost its competitive thrill. Vettel admitted it hurt to hear boos in Belgium, Canada and Silverstone. "It was not an easy season," he said, even if he has won 10 grands prix. "It was very difficult for me personally to receive boos even though I hadn't done anything wrong. To overcome that, and give my answers on the track, makes me very proud." The other teams and drivers have failed to offer any effective competition, but Vettel didn’t want to underestimate the difficulties he faces. "It's incredible to race some of the best drivers in the world, it's a very strong field and to come out on top of them is unbelievable."